About The Intermatic P1353ME ThreeCircuit Pool amp; Spa Digital Control Timer Mechanism The Intermatic P1353ME ThreeCircuit Pool amp; Spa Digital Control Timer Mechanism combines the standard features of Intermatics control centers with the convenience of digital automation. The Intermatic P1353ME ThreeCircuit Pool amp; Spa Digital Control Timer Mechanism provides the ability to program up to three circuits. The Intermatic P1353ME ThreeCircuit Pool amp; Spa Digital Control Timer Mechanism allows for control of single and twospeed pump/booster pump applications, and the auxiliary modes can be used to control pumps up to three horsepower as well as underwater, garden or fountain lighting. The Intermatic P1353ME ThreeCircuit Pool amp; Spa Digital Control Timer Mechanism features countdown and override functions that allow for cycle interruptions when the pool or spa requires service. All timing and protection associated with booster/cleaner pump combos and twospeed pumps has already been integrated into the digital software of the Intermatic P1353ME ThreeCircuit Pool amp; Spa Digital Control Timer Mechanism. 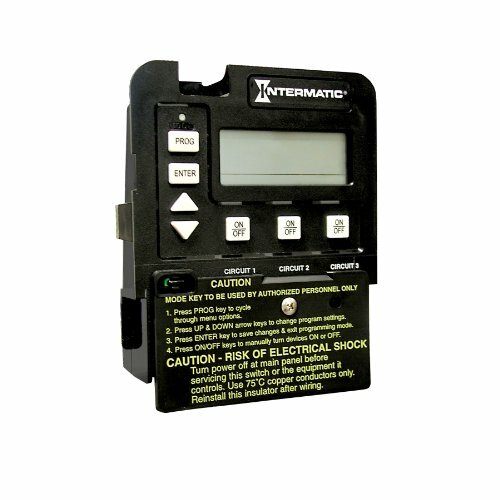 The Intermatic P1353ME ThreeCircuit Pool amp; Spa Digital Control Timer Mechanism also has provisions to install a switching device or GFCI receptacle on the side and additional accessories inside.